It is said that mindfulness is like a bird; it needs two wings to fly. 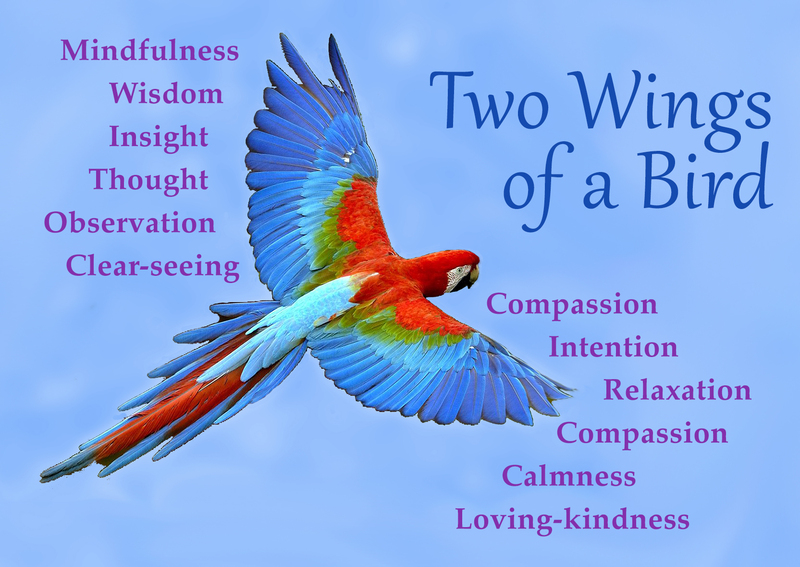 The two wings are clear seeing or wisdom and compassion. In our meditation circle, we spoke about this and why cultivating compassion is such an important part of the practice. It is like the image of the bird, both wings need to be in balance in order for the bird to soar. When compassion isn’t informed by wisdom, it turns to pity. Too much wisdom and it turns into intellectualization. So, there must be a balance between compassion and wisdom, to help us stay present with the challenges we face in life, and to learn from them. In this post I’d like to focus on the wing of compassion/self-compassion. As a therapist, I counsel clients, who are facing challenges in their lives. So compassion towards their suffering, is an important part of the healing process. It is also important to have self compassion, to be a compassionate witness to what is difficult to be with. Compassion and self-compassion, are healing antidotes to pain. It is indeed powerful medicine, when we are able to meet pain in this healing way. Meeting pain in this way helps us stay grounded and present. It also helps us slow the chain of reactivity and come into connection with the qualities of mind and heart that are able to open to, and hold what is difficult. We become aware, of our moment to moment experience, meeting it with curiosity and kindness. With this present moment awareness, we can attend and befriend that which is in need of kind attention. This is the opposite of what we usually do when we are hurt, angry or grieving. Our habitual reactive response to these feelings, is to defend ourselves. This isn’t helpful, as it takes us further away from the healing power of the heart. And this is where self-compassion is needed. With mindfulness, we become aware of how we are paying attention to what is happening in the present moment. When we pause and slow down the reactive mind, wisdom can arise and with wisdom, a moment of choice. This moment is a pivotal choice point; continue down the road of reactivity/suffering or shift towards a more healing response. This is the power of self compassion. We shift from needing to find the villian in the story (others, ourselves), to helping ourselves tend to what is tender and in need of acceptance and kindness. There isn’t a need to go after, or punish anyone. Instead, we turn towards the pain and recognize, that this is a moment of suffering. With that recognition, self compassion arises and we can then be with what’s happening, bringing kindness and compassion to it. So what does that look like? It’s not an easy practice, this turning towards pain. Especially when we’ve been conditioned to respond to pain with aversion, as if it’s not a part of life. So, as you are learning to practice self compassion it is important to be patient with yourself. What I’ve found to be most helpful, is to shift from the story about what happened/is happening to what is felt in the body. so I’ll experience anger as a burning feeling in my stomach, when I feel that, I place my hand on my stomach as a symbol of care and compassion. This instantly brings me into contact with what is happening in the present moment. I feel the pain that is beneath the anger and if I stay with it, breathing into the area of distress and softening around it, the hurt begins to soften. This didn’t happen when I practiced for the first, second or 20th time. It took time to really learn how to shift from feeding the anger with thoughts and stories, to be with the direct painful experience that was happening in the present. A resource that helped is Kristin Neff’s book Self Compassion; The Proven Power of Being Kind to Yourself. It also helps to belong to a Mindfulness Meditation Circle that focuses on exploring the practices which help us cultivate wisdom and compassion. Our Sangha, has definitely helped me to deepen my own meditation practice and how these teachings help us cultivate wisdom and compassion. However, if you don’t have a local group, there online groups you may join, that practice on a regular basis. With the state of the world today, there truly is a need, for all of us to learn how to be a healing presence for all living beings. This helps us and when we are more compassionate towards ourselves, we are able to be more compassionate towards others. Want to learn more? Join us at our weekly meditation circle, RSVP at Meetup.com or at our upcoming 5 Day Residential Mindfulness Retreat at Casa San Carlos Retreat Center. To register go to our Event Registration page. If you would like more information on this practice, please feel free to contact me here. Going away on a spiritual retreat is an act of courage and kindness. When we enter Noble Silence, we take a vow to keep silent for a certain period of time. this commitment is an important part of retreat practice as it is in the stillness and silence that we get to connect with the vibrant aliveness that is always present. We connect with our senses; noticing sights, sounds, smells, touch, tastes and thoughts. This is completely different than the way we usually move through life. When we come into retreat we are making a commitment to be present for life in all it’s joys, sorrows and everything in between. In doing this, we get to reconnect with the wisdom and compassion that is available to us at all times. Seeing life as it is…. hesitation, nervousness at the though of prolonged silence, especially when the attendees were informed that they should set aside all mobile devices and refrain from contacting friends and family (excluding emergencies). This is quite a commitment in today’s world of easy access to news, social media family, etc. However, it’s also a gift. The gift of being present to life as it’s happening; of connecting with the aliveness, wisdom and love in an up close and personal way. We make a commitment, to bring a kind and clear attention to our lived experience moment to moment, without judging it. This gives us freedom to just be! And connecting with life in this way allows us to take a much needed rest from the busyness of life. At the start of retreat we read a poem by Kaveri Patel (below) that speaks eloquently about the chattering mind. Meditation helps tame the mind…. “Meditation is a way to calm the monkey mind and offers relief from the constant mental chatter. It is actually not a way to make the mind “go” quiet – rather it’s a way to access the quiet that is already there, buried under the 50,000 or so thoughts that the average person has every day.” From the Project Flow Blog. are not the enemy, when we react to them as if they’re facts, this can create much stress and confusion in our lives. Coming into retreat, gives us an opportunity to notice, often for the first time, how we are relating to our thoughts and how our thoughts affect us and those around us. For example, when our thoughts are filled with worry, the body reacts by preparing for a threat; tension arises, the heartbeat races, the muscles contract, your digestive system slows down. And that’s all just based on a thought! As the Buddha stated “whatever a person frequently thinks and ponders upon, that will become the inclination of his/her mind. 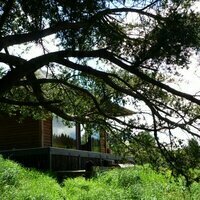 In retreat you get to see it, sense it, and learn to tend and befriend the chattering mind. We stop the war against ourselves and life and move towards wisdom, kindness and loving connection. Mindfulness practice allows us to pause and connect with the life as it’s happening. The practice helps us recognize when thoughts are happening; and as space between thought and reaction develops, we notice how the body, mind and heart are affected by the thoughts. This pause allows for wisdom to arise; we begin to learn how to shift from reacting to responding and the reality is, that life is constantly changing. When we resist change we resist life; we get stuck in trying to control what’s happening around us. This stops us from living and appreciating/responding to life in a way that is wise, healthy and compassionate. Practicing mindfulness, helps shines a light on this, in a way that goes beyond words, concepts and beliefs. It is the practice of sitting with the resistance, with the inner struggle, with anger, with doubt, with joy, happiness etc. It is a noble act to stop running and to be present for the experience of being alive. When we connect with life in this way we sense and experience the preciousness of each moment. It is like holding a precious bird in hand, knowing that at some point it will fly away and grateful for the gift of it’s presence. Please consider registering for our next 5 day retreat which will take place, April 19th-23rd at Casa San Carlos Retreat Center in Delray Beach, To register and pay in full please go to Eventbrite-April 19th-23rd or to sign up for the installment plan please click here. Our planet is but a speck in the universe and within that speck, we are like a grain of sand. Yet, when we face challenges, it’s as if we are the universe and everything else is a grain of sand. This is not to dismiss the reality that all of us face challenges; gain and loss, pleasure and pain, fame and shame, and praise and blame. This is what the Buddha called the 8 worldly winds. We all experience this, we get caught in it, like the fly in a spider’s web; we’re drawn to the promise of pleasure and when it turns out not to meet our expectations or is unpleasant we struggle against it. And this can happen dozens of times a day, hour, minutes or seconds. We ride the roller-coaster of desire (climbing) and/or aversion (descending) and it’s exhausting!